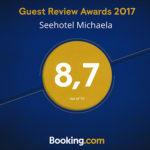 Our "Seehotel Michaela" has an à-la-carte restaurant with room for about 65 people and a cafe with room for about 100 people. In an idyllic atmosphere with an unique panoramic view of the lake, you can enjoy the varied, regional and international cuisine, suitable for all seasons. Your wellbeing is what is close to our hearts - so we use only seasonal, native and naturally fresh ingredients for our dishes. Choose from a variety of different sorts of draught beer your favorites and enjoy a freshly tapped beer. A selection of superb wine and the great service Team round off your visit in our restaurant. Not only our hotel guests can attend our breakfast buffet ad libitum. Reservate a table for you and your guests at the "breakfast at the sea" for a good start into the day. 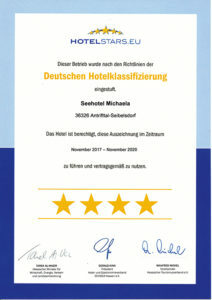 There's no better place to enjoy a good time than in our cozy à la carte restaurant at the "Seahotel Michaela". Let yourself be pampered in our restaurant!